When Franklin D. Roosevelt visited New Orleans, he and his entourage dined at the fabled Antoine’s restaurant and ordered their specialty dish “Oysters Rockefeller”. The mayor reportedly said to FDR: “How ya like dem ersters?” Before Antoine’s proprietor Jules Alciatore invented this dish, oysters were usually eaten raw on the half-shell. They were named after John D. Rockefeller, the richest man in the world at the time. They are green like money so the “rich” theme is extended. People in the Crescent city sometimes debate the “Oyster Rockefeller” ingredients; nowadays the green vegetable is invariably spinach. Before J. Alciatore passed away, he said spinach was not the secret ingredient in “Oysters Rockefeller”, and would not disclose what he used. People have from time to time tried other green vegetables and many have come close, suggesting Florence fennel or tarragon etc. I haven’t baked “Oysters Rockefeller” in awhile, they are not available where I reside, but I recall the recipe and can link to one. If you like mollusks and have access to oysters, try this recipe, you will see why it is among the most praised dishes around. Mince together the parsley, green onions, celery leaves, tarragon and chervil as finely as you possibly can. Take as much time as you need. Mince them more finely than anything you've ever minced in your life. Mix this together with the breadcrumbs and the softened butter into a mortar and mix the whole thing together into a smooth paste, but do leave a little texture to it. (You can do this in a blender or food processor, but you'll leave a lot of it behind, stuck to the inside, and it'll be just easier to do it by hand in a mortar; you'll have an easier time getting it all out, and you'll have the satisfaction of serving something truly hand-made.) Season to taste with salt and pepper, Tabasco or Crystal and, if you like, the Herbsaint. Preheat your broiler. Lower the top rack to the middle of the oven. Spread the rock salt (preferable) or kosher salt over a large baking sheet; this will keep the oysters level under the broiler, so that they won't tip over. Moisten the salt very slightly. Plant the shells in the salt, making sure they're level. 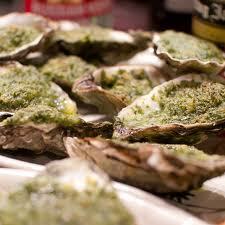 Place one oyster in each shell, plus a little bit of oyster liquor. Spoon an equal amount of the prepared herb/butter mixture over each oyster. Place the baking sheet on the middle rack and broil until the edges of the oysters have curled and the herb butter is bubbling, about five minutes. Watch carefully to make sure you don't overdo it. Serve immediately. If you cannot obtain fresh chervil or tarragon try to substitute with watercress. In this case, try to use the anise- flavoured cordial in this. If you can get fresh oysters already shucked but no shells you could use small ovenproof dishes or ramekins. OMG, you're making me hungry. Love the recipes and can't wait to try some. Yum! love the recipes until today. Just can't do oysters!! yum! I've only ever made oysters kilpatrick. I'll have to give this a go. Alciatore should've disclosed the secret; passin on is so fulfilling! thnx again for the trivia and recipe!